Mar. 4, 2015 8:00 a.m.
To get something important accomplished, you need enthusiasm, dedication and focus. Those are the qualities that seem to apply to a small group of Grade 8 students at Christ the King Junior/High School in the City of Leduc (CTK). Led by an enthusiastic grade 8 student, Abby Oliver, daughter of an environmental consultant, the CTK Environmental Club was created last December earning the dynamic support of Mr. Jordan Robinson, CTK’s vice-principal. It was important to Abby to see some measures in place to recycle what could be recycled within the school. Abby, along with her parents Mark and Katie and her brother Matthew moved to the City of Leduc 18 months ago. In Abby’s Ontario school, environmental and recycling procedures were well established, earning the school a Gold Award on three consecutive years for its collective effort. The CTK Enviro Club members have embraced their duties with energy and enthusiasm, designing posters to educate fellow students and hauling bins in and out of the school. It takes focus and perseverance, but is worth it. On Pizza Day, for example, an entire green bin gets filled with empty pizza boxes that in the past would have ended up in the waste bin, bound for the landfill. Students seem to pay attention to this new knowledge that leftover food should go into the compost bin and paper goes in blue bags. Hopefully they bring this knowledge home and share it with their parents whose childhood did not mention recycling at all. 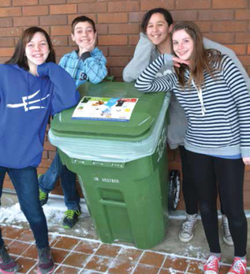 A Recycling and Waste Diversion Pilot Project was created last December after months of preparation during the fall within Christ the King and two Leduc elementary schools, Willow Park and Caledonia, which surprisingly approached the City at the same time last summer. Willow Park and Caledonia School boast two school teachers firmly supporting the project and ensuring that their students follow the recycling guidelines, which many of them live by at home. Sort Smart is a phone application designed by the City of Leduc to give advice to residents on recycling and waste diversion methods, as well as the curbside pickup calendar. With young champions working hard at recycling, thus diverting waste away from the landfills that do have an ‘expiration date’, our environment is in good hands. Hopefully this trend will continue to expand into entire school divisions. Pictured: Abby Oliver, founder of the CTK Enviro Club (left), poses with Cameron Loitz, Anna-Maria Perez and Kaitlynn Gavrelets. Several club members are missing from the photo. Photo by Dominique Vrolyk.